The "Logo Paintings“ series Rainer Gross has been working on since 2010 has a long history. One doesn’t need to know it to be able to savour the painterly quality and the spirit of these individual paintings and works on paper in strong colours, alternating between readability and abstraction. They do, however, gain in depth and persuasive power if one sees them within the context of the expansive oeuvre full of changes and new inventions Rainer Gross has created in the course of four decades now. For a good 20 years the artist, born in Cologne (Germany), who has been living in New York since 1972, in Manhattan, to be precise, is known on both sides of the Atlantic through numerous exhibitions as an abstract painter. With the invention of “Contact Painting”, a casting technique he developed starting from traditional monotype transferred to painting, he created for himself a flexible instrument with which he was able to make experiments in different directions. This method enabled him to bring chance and control in varying proportions into the process of painting. With that Rainer Gross was able to add a processually oriented variant to abstract painting, beyond the monochrome, colour painting as well as radical painting. The “Logo Paintings” evolve, by way of painterly technique, directly from the “Contact Paintings”, with the decisive difference that they leave the pure non-representational behind through their reference to very widespread company signets and popular symbols, which are also anchored in collective memory. Many visitors who have seen the retrospective “Rainer Gross. Kontact. 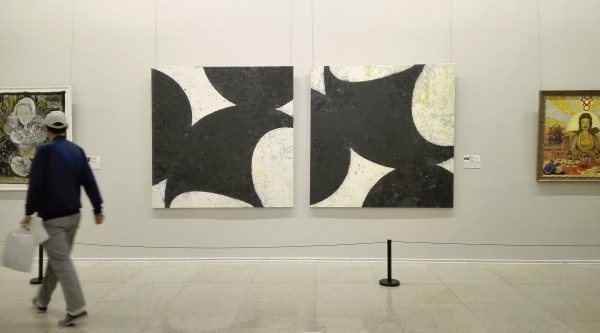 New York Paintings 1972–2012 at the Ludwig Museum in Koblenz, Germany, or who studied the accompanying book, may for the first time have realised that the abstract painting of Rainer Gross was preceded by a long time of “figurative” painting, running through several interphases. In these he questioned figuration, asking what figuration was still able to represent in the age of mass media image production. A decisive influence on the artistic development of Rainer Gross was that he went to America, leaving behind the stuffy academic instruction at the Kölner Werkkunstschule and learn painting as an assistant to such American heroes of painting as Howard Kanovitz, Robert Motherwell, and especially Larry Rivers. When he decided to give up his job, after five years together with Rivers, and make his way as an independent artist, he was under the enormous pressure to hold his own as a European, a German, a “Kölsche Jung” (Cologne homie) in New York City. A guiding principle was the tension between his upbringing in the European history of painting and the American art scene with its greater amount of liberty but also higher economic risks. This tension created brilliant, partly very large paintings, in which Gross integrated historical quotations from Peter Paul Rubens back to the Altar of the City Patrons (Cologne) by Stefan Lochner, the most important icon of Cologne self-understanding, combining these with motifs of American everyday life such as TV and football. With his astonishing ability to adopt highly different painterly techniques and idioms very fast, Gross developed a palette of “post-modern” methods of quoting, paraphrasing, and parodying styles of painting. In the early Eighties this led to the comprehensive series of the so-called “Democratic Paintings”, in which he carried the combination of high and low to extremes, i. e. the combination of quotes from Old European painting and kitschy mass produced items. Gross invented the method of integrating unchallenging five-and-ten art from the Far East into his paintings in a collage-like manner. The Pictures from this period, mostly quoted motifs from the history of art, from Rembrandt to German expressionism, were interspersed with moody mountain landscapes, garishly multicoloured clowns, sailboats, panda bears, and fruit still lifes. In his quest for what could be painterly culture today he needed the petty bourgeois kitsch as an antithesis and a springboard into an unfettered painting full of contradictions. The art of Rainer Gross always had a personal relation, but there was one biographical event that influenced his painting in a very special way: 1993, at the age of 42, the artist, in his second marriage with the American Cynthia Cannell, became a father. The birth of his daughter Clara effectuated a marked disruption of his development, the transition from the figurative to the abstract. In his own words he “wanted to grow up at last” and turned, for a number of years, to “Fingertip Tinglings”, a very reduced, meditative way of painting, consisting only of the superimposition of different patterns. It was somewhat by chance – provided there can be anything like chance on this artistic level – that Rainer Gross discovered, when he produced monotypes on paper, how fascinating the amorphous remnants of colour were which stuck to the roughened surface of the acrylic plate after printing. Gross began to look for a method to create this kind of colour phenomena in large-scale paintings, too. He discovered the technique of pressing canvases coloured by different colour-materials on each other. One of the two was covered with dry pigments, the other one with still wet oil colours. Carefully separating the two canvases made many or few layers of pigment stick to the wet oil colours, correlating with the pressure exerted. So each time a pair of identical twins were generated, albeit with “genetic defects”, as both twins weren’t only reversed in orientation, but also because the deeper layers of pigment came out on top of the other canvas and the pigments reacted with each other differently in each case. Using this technique, Gross was able to accentuate a multitude of different subjects: structure, colour, chance, process, but also conceptual questions concerning the states of original and duplicate, respectively copy. The fact that Rainer Gross incorporates company logos or signets of pop culture like the Batman symbol or Mickey Mouse in his “Contact Paintings” shows that he wants to integrate an external relation, a subject matter in his painting again. But it would be premature to say that by doing so he had left abstract painting. One could even say that the “Logo Paintings” are abstractions of abstractions. This is because logos are in themselves abstract, sign-like compactions not only as indicators of certain products, but also of fundamental principles of global capitalism (the role of advertising, the big companies as global players a.s.o. ); in many cases logos very decisively stand for a sense of life. The white curved lettering on red background of Coca Cola, for instance, stands like no other symbol for the American Way of Life and is understood this way all over the world and quoted in many contexts. Newer logos like those of Apple, Facebook or Twitter stand for the lifestyle of the younger generation, integrating as a matter of course being online and communication in social networks. building-set system is shortened in a way so that initially you only see “EGO” – a sudden reminder that the sociology of the post-modern individual already speaks of “patchwork identities” and “Crafting existence”. With the logo as motif Rainer Gross is consciously joining the specific context of American painting. It will suffice to name just a few examples: Just think of Edward Hopper’s famous gas station painting “Gas” of 1940 with the winged red horse of the Mobilgas Company, of Larry Rivers’ countless paraphrases of the Camel cigarette packs or of Andy Warhol’s Brillo-Boxes and Campbell’s Soup cans, and not to forget Robert Indiana, who changed the word “love” into a pop logo of world-wide recognition. By using company logos in American Pop art, painting and graphic design meet at eye-level, and it just there that Gross’s “Logo Paintings” differ, as they are decisive painterly adaptations of these Pop art motifs. Logos depend on clarity, on easy readability and recognition. This way they represent a unequivocal, “clean” image. In every day life we therefore always meet logos printed in strong colours on glossy paper, as neon ads or on computer screens, on polished surfaces of plastic or metal. In Rainer Gross’s work the colours are broken, the surfaces roughened, and the readability made difficult by fragmentation. A lot of his logos look as if the ravages of time have been at them, as if they were weathered billboards, archaeological finds of a long distanced future, in which one looks, bewildered, at the remnants of the 20th and 21st Centuries. Is that a quiet expression of irony, a hint at criticism of capitalism – and thus a typically European view of consumerism? It is, probably, more subtle: Rainer Gross looks at a phenomenon of today’s world with the eyes of a painter, a phenomenon that reduces our perception to a simple stimulus-reaction pattern. A curved yellow M on a red surface – McDonald’s – and promptly follows a locked schema: Fast Food, like it or leave it. Logos are there to transmit information fast so that we can react to it. By transubstantiating this element of our present information-swamped visual culture into painting, he slows recognition down: The logos as such are recognisable and yet they turn into something else; Colours, forms, nuances, contrasts, materially prehensile surfaces, textures. Under the eyes of the painter recognition is being decelerated: Looking at the “Logo Paintings” we understand more, differently, more nuances, and more consciously than in everyday life, where we only react reflexively to visual stimuli. Rainer Gross’s painting does not content itself with affirmation.